Like the MGB GT featured a couple of days ago, this car is a barn find. For many, many years you could buy a 190 SL for relatively little money. Not anymore. The 190 SL is getting the recognition it deserves and the prices are climbing. The biggest problem the 190 SL had in getting recognition was that it shared the showrooms with the 300 SL, a legendary car if there ever was one. That, and the fact that Mercedes, then and now, was not known as a maker of true sports cars, kept it in the shadows. Edmunds.com probably summed it up best when they wrote "Perhaps if it hadn't shared showrooms and the spotlight with its bigger brother, it would have been considered among the best sports cars of the era. But it wasn't a Triumph or an MG, it was a Mercedes, and many sports cars shoppers dismissed it as a half-hearted car." The 190 SL is not a half-hearted car. It's a well built German roadster; a very nice one at that. This 190 SL has been in storage for 10 years. It has just under 48,000 miles on it and is amazingly well preserved. The seller had noted 190 SL restorer, Bruce Adams (www.bruceadams190SL.com) look at it and he stated: "It is original, low mileage (47,892) and appears rust-free from a visual inspection. Undercarriage is completely solid as well as all the body panels. Engine is strong and runs very good. The car sat for at least 10 years, but we had little trouble getting it started and running. Tires should be replaced as well as collapsed motor mounts replaced and the brake system inspected. 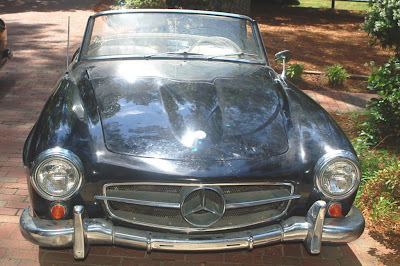 Generally, this 190 SL starts, runs, & stops well enough to be driven." The "Buy It Now" price for this car is $34,995.00. For maybe that amount again (probably more), you could turn it into a show car. Or, assuming the car is what it appears to be, with another $4000.00 - $6000.00, you could turn this into a very nice driver. I'd do the latter. Click here to see the International 190 SL Group website. It has and active forum and a ton of information and pictures. You know, I have never seen an ugly SL, every single model has, imho, been a beautiful looking car. My uncle had of these back in the 80's and even then very few people were interested. He sold the thing for peanuts and regretted it ever since. Back in 1990 I could have bought a very nice 190 SL for $6000. I passed. I've been kicking myself ever since.